Boney M. is a Euro-Caribbean vocal group created by German record producer Frank Farian. Originally based in West Germany, the four original members of the group's official line-up were Liz Mitchell and Marcia Barrett from Jamaica, Maizie Williams from Montserrat and Bobby Farrell, a performing-artist from Aruba. The group was formed in 1976 and achieved popularity during the disco era of the late 1970s. Since the 1980s, various line-ups of the band have performed with different personnel. The band has sold more than 80 million records and is known for huge international hits such as "Daddy Cool", "Ma Baker", "Sunny", "Rasputin", "Mary's Boy Child – Oh My Lord" and "Rivers of Babylon". I turned on the TV one day and it was the end of a detective series. I just caught the credits and it said Boney. Nice name, I thought – Boney, Boney, Boney... Boney M. Boney, Boney, Boney M. Nice sound. Simple. After a slow start, the song became a hit in the Netherlands and Belgium. It was then that Farian decided to hire performers to 'front' the group for TV performances. Farian found Maizie Williams (originally from Montserrat), who brought in Bobby Farrell, a male exotic dancer from Aruba. Singer Marcia Barrett (from Jamaica) joined the group, who brought in Liz Mitchell, former member of the Les Humphries Singers and Boney M. was finalised. Boney M.'s first album, Take the Heat off Me, was released in 1976. It contained tracks that Marcia Barrett had already recorded with Farian, including the title track and "Lovin' or Leavin'", both of which were previously recorded in German by another Farian act, Gilla. As Maizie Williams' voice was not considered suitable for recording purposes by Farian, and a try-out with Bobby Farrell performing "No Woman No Cry" did not work, Farian decided to use only Liz Mitchell and Marcia Barrett along with his own studio-enhanced voice to create the Boney M. sound. 1978 was the group's biggest year. They released a new double A-sided single, "Rivers of Babylon/Brown Girl in the Ring", which became a massive hit all over Europe, reaching No. 1 in several countries as well as becoming one of the biggest selling singles of all time in the UK. It also became their most successful single in the United States, peaking at No. 30 on the U.S. pop singles chart. Following this came their biggest-selling album, Nightflight to Venus, which spawned further hit singles with "Rasputin" and "Painter Man". Continuing with their success, they released "Mary's Boy Child – Oh My Lord", which was the 1978 Christmas number one single in the United Kingdom and became another of the biggest selling singles of all time there. Also during 1978, Boney M. made a much publicized promotional visit to the Soviet Union, one of the very few Western acts along with Elton John to do so, although tracks like "Rasputin" were not released in the Soviet Union due to their lyrics. While it had never been a secret that Bobby Farrell never sang on the group's records (Farian did the male vocals in the studio), in 1978 it became public knowledge that Maizie Williams did not sing on the studio recordings either, since "her voice wasn't suited for this kind of music" as Farian stated in an interview with German teen magazine Bravo. Since this had become common practice within the disco genre of the late 1970s, few people cared – unlike when Farian did the same thing with Milli Vanilli in the late 1980s. While only two of Boney M.'s official members actually contributed to the band's records, all four members of the group, including Williams and Farrell, performed the vocals live at Boney M. concerts. The band's live sound was also augmented by several backing vocalists, which served to mitigate any vocal deficiencies the group may have had compared with the studio productions. In 1980, Boney M. released a greatest hits album, The Magic of Boney M. – 20 Golden Hits, which also contained two new songs, "My Friend Jack" and "I See a Boat on the River". It made the No. 1 spot in the UK, reaching Gold status within six weeks of release, though it was their last big-selling album in the UK. Boney M.'s fifth album had been scheduled for release in November 1980 but the recording sessions dragged on all through 1981. When Boonoonoonoos was finally released by the end of that year, Bobby Farrell was fired from the group due to his unreliability. While still a healthy seller in continental Europe, Boonoonoonoos failed to crack the UK Top 100 after three consecutive No. 1 albums, and Farrell's departure left the group unable to promote it. Following this, the group released a Christmas Album. Reggie Tsiboe was hired to replace Farrell as the new male member of Boney M. in 1982 but the singles "The Carnival Is Over" and "Jambo" fared poorly, and the group's seventh album Ten Thousand Lightyears, issued in 1984, marked another commercial low point peaking at #23 in the German album charts. The group, however, returned to the German Top 20 in the autumn of 1984 with "Kalimba de Luna" (a Top 10 hit in France) and "Happy Song" (a cover of a song by Italian Italo-disco band Baby's Gang), the latter seeing Bobby Farrell return to the group. Both songs were carbon-copies of the original Italian hits by Tony Esposito and Baby's Gang respectively. By 1985, Farian clearly began losing interest in the group, and their final and eighth studio album Eye Dance was widely regarded as uninspired and disappointing. After celebrating Boney M.'s 10th anniversary in early 1986, the group officially disbanded after the release of the commercially unsuccessful single "Young, Free and Single" which peaked at No.48. From this point, different versions of the group were formed by members, some with cooperation of Farian, others without (for example by independently obtaining the rights to use the Boney M. name in a different country). One version began touring in the first half of 1987 with Marilyn Scharbaai (Carrilho) taking Liz Mitchell's place. Mitchell returned for a second leg of the tour late 1987, and Marcia Barrett soon left the band. At the same time, Bobby Farrell had set up a deal for a new Boney M. album to be recorded without Farian in Belgium. When Farrell failed to show up for either recording or tour, and Maizie Williams had never sung on record, the album ended up being released as Liz Mitchell's first solo album No One Will Force You. Mitchell and Williams completed a tour during 1987–88, adding singer Celena Duncan and Ron Gale as replacements for Barrett and Farrell. Carol Grey later replaced Celena Duncan and Curt De Daran later replaced Ron Gale. In October 1988, the classic Boney M. line-up reunited without producer Frank Farian for the album Greatest Hits of All Times – Remix '88 but tensions ran high between the members, and Liz Mitchell left in the spring of 1989 to be replaced by Madeleine Davis. While Mitchell promoted her solo album, the group recorded the single "Everybody Wants to Dance Like Josephine Baker", without Farian's knowledge or approval. Threatened with legal action by the producer over the use of the Boney M. name, the single was subsequently withdrawn and Farian issued "Stories" with his own new Boney M. line-up featuring Liz Mitchell, Reggie Tsiboe and two new members, Sharon Stevens and Patty Onoyewenjo, "Stories" peaked at #11 in the Swiss charts. A second remix album Greatest Hits of All Times – Remix '89 – Volume II was released but fared poorly. 1992 saw a renewed interest in Boney M.'s music with the "Boney M. Megamix" single returning the group to the UK Top 10 for the first time since 1980, and a subsequent Greatest Hits album reaching the UK Top 20 in 1993. While Marcia Barrett, now residing in Florida, was battling cancer and unable to perform, Boney M. toured the world with a line-up of Liz Mitchell, Carol Grey, Patricia Lorna Foster and Curt Dee Daran (replaced by Tony Ashcroft in 1994). They released the single ‘Papa Chico’ but failed to chart. Maizie Williams assembled her own Boney M. line-up with her friend and short-time Boney M. member in the early days in 1975, Sheyla Bonnick, and two others. Bobby Farrell also toured with three ever changing female performers. In January 2009, Frank Farian released a brand new single called Felicidad America (Obama Obama) under the name-check Boney M. feat. Sherita O. & Yulee B. featuring two new vocalists. The song is a remake of the 1980 Boney M. classic Felicidad (Margherita) with new vocals and re-written lyrics now referring to the new US president Barack Obama. In March 2015, Farian released Diamonds, a 3CD box celebrating the 40th anniversary of Boney M. It contained remastered versions of the original hit singles or of previously unreleased versions, a remix disc and the new digital single Song of Joy featuring Liz Mitchell. A major DVD set was also released. In February 2017, they performed at the closing ceremony of Patras Carnival in Patras, Greece. 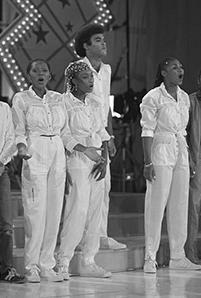 The group achieved a second UK million-seller with their version of the calypso classic "Mary's Boy Child", released as a medley "Mary's Boy Child – Oh My Lord", which was previously a million-seller for Harry Belafonte. The single sold over 1.8 million copies, 1.6 million of which were in the four weeks the song was at No.1 in December 1978. Boney M. are the only artists to appear twice in the top 11 best selling singles of all time in the UK, with "Rivers of Babylon" in 7th place and "Mary's Boy Child/Oh My Lord" at number 11. They are also one of six artists to sell a million copies with two singles in the same year. Compared to other best-selling artists of the 1970s like ABBA, Donna Summer, and the Bee Gees, the Boney M. discography is quite unusual – while the greater part of the band's back catalogue has been remixed, remade, remodeled and reissued all through the 1980s, 1990s and 2000s by producer Frank Farian and record company BMG-Ariola (now Sony Music), most of the original 7" and 12" versions issued on vinyl in the 1970s and early 1980s remained unavailable on CD until 2008 and the release of the box set The Collection and the single CD compilation Rivers of Babylon (A Best of Collection). Boney M. was hugely popular in the Soviet Union in the 1970s, although the song "Rasputin" was banned by the Soviet authorities during the group's concert in Moscow in December 1978. In the Soviet film Repentance (1987), "Sunny" is played at a party of high-ranked communist officials. "Sunny" is played during a few parts of the successful Korean film of the same name, Sunny. It is the theme song of the 2011 Taiwanese drama starring Rainie Yang and Wu Chun, Sunshine Angel. ^ "Whatever happened to Boney M?". BBC. 29 January 2002. Retrieved 28 November 2018. ^ Germany, SPIEGEL ONLINE, Hamburg. "Starproduzent Frank Farian: "Deutschland sucht den Superstar - und findet ihn nicht" - SPIEGEL ONLINE - Kultur". Retrieved 30 December 2016. ^ "Certified Awards Search". British Phonographic Industry. Archived from the original on 24 September 2009. Retrieved 2012-01-10. ^ "Fantastic Boney M". Musiclange.dk. Retrieved 15 October 2011. ^ "Offizielle Deutsche Charts: Young, Free And Single". Offizielle Deutsche Charts. Retrieved 25 December 2018. ^ "Melo-M & Maizie Williams ar videoklipu "Daddy Cool" LMK TOP10 pirmajā vietā". Retrieved 30 December 2016. ^ "Maizie Williams official website". Maiziewilliams.com. Retrieved 15 October 2011. ^ "PROLIFIC MEDIA GROUP UK – Music & Design Studio ::: Music Production | Design | Creative Consultancy | A&R | Publishing". Prolificmedia.co.uk. Archived from the original on 6 October 2011. Retrieved 15 October 2011. ^ "The Truth Herzl: Despair and Joy: 24 Hours Around Jerusalem". 14 September 2010. Archived from the original on 14 September 2010. Retrieved 30 December 2016. ^ ""How Shall we Sing the Lord's Song in a Strange Land?" on Everywhere by Yuval Ben Ami". Yuvalbenami.blogspot.com. 21 July 2010. Retrieved 15 October 2011. ^ "The Associated Press: Boney M asked to skip hit in West Bank gig". 25 July 2010. Archived from the original on 25 July 2010. Retrieved 30 December 2016. ^ "Bobby Farrell (61) overleden". NU.nl. 30 December 2010. Retrieved 30 December 2010. ^ "Boney M's Bobby Farrell has died, aged 61". RTÉ. 30 December 2010. Archived from the original on 2 January 2011. Retrieved 30 December 2010. ^ ""Boney M singer Bobby Farrell dies aged 61", BBC News". Bbc.co.uk. 30 December 2010. Retrieved 15 October 2011. ^ "Enmore Theatre". Retrieved 30 December 2016. ^ "Boney M at Patras Carnival". The Greek Observer. Retrieved 15 January 2018. ^ "Naughty Boy and Sam Smith smash 1 million UK sales with La La La". Official Charts Company. 10 June 2014. ^ Boney M – Russkaya Narodnaya Gruppa = Boney M – Russian Folk Group : documentary film (in Russian) // RTR. Moscow: Biz-Group, 2005. Wikimedia Commons has media related to Boney M.